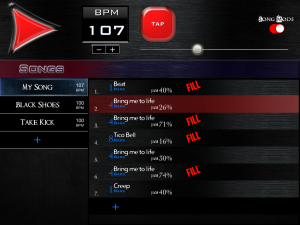 The most important update for Rock Drum Machine will be available in a few days with the desired “Song Mode” and many new improvements. Following the line of the app, “Song mode” is a very easy, quick and funny way to create your songs structure, setting rhythm, bars, jamming level and fill for each part. But it isn’t the only major improvement for this version. We’ve been working conscientiously to improve the stability of the application, modifying code and database. New sounds, new soundsets, “Shuffle” bank and rhythms have been added. It will not take long until it is available for download from the app store, so stay tuned! This entry was posted in Rock Drum Machine, Updates on January 16, 2015 by LumBeat.